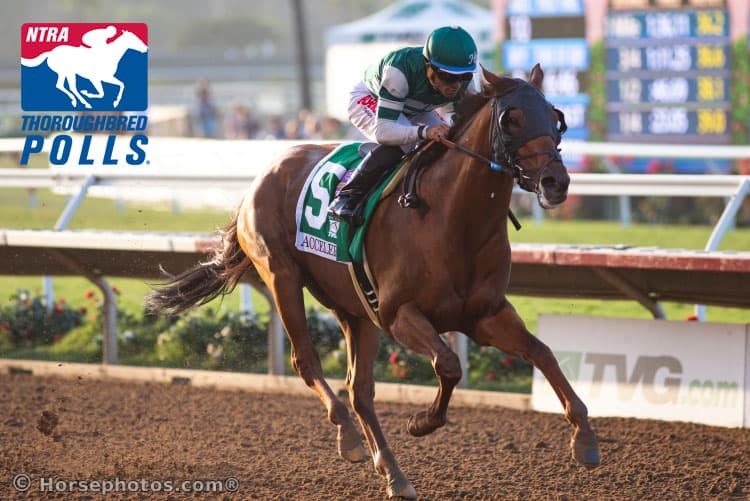 Accelerate, the 3-1 favorite in recently closed future wagering on the Breeders’ Cup Classic, retained his grip atop the NTRA Top 10 Thoroughbred Poll for the eighth consecutive week. Owned by Hronis Racing, LLC, Accelerate received seven first place votes and 292 points. Retired Triple Crown winner Justify was second in the poll with 24 first place votes and 276 points. Leading Breeders’ Cup Sprint contender Imperial Hint was the only other horse to receive a first place vote. The five-year-old was ranked sixth in this week’s poll with 131 points. Accelerate, who won the Awesome Again Stakes at Santa Anita Park on September 29 in his final prep for the Breeders’ Cup Classic, is one of as many as five Classic hopefuls ranked in this week’s Top 10 poll. The others are Mind Your Biscuits (third place, 158 points), who also is considering the Breeders’ Cup Dirt Mile or Sprint, Travers hero Catholic Boy (fifth place, 132 points), Yoshida (seventh place, 118 points), who like Catholic Boy is a Grade 1 winner this year on dirt and turf, and West Coast (eighth place, 114 points), last year’s Eclipse Award-winning three-year-old colt. In other changes to this week’s poll, Mind Your Biscuits (third place, 158 points) and Monomoy Girl (fourth place, 155 points) flip-flopped positions from last week. The lone newcomer to this week’s poll was Sistercharlie (50 points), who replaced Diversify in tenth-place. Sistercharlie was ranked eleventh in last week’s poll. Catalina Cruiser (73 points) remained in ninth place.